At Horseshoe Bend, the Colorado River made a simple U-Turn and headed back in the other direction. Geologists and hydrologists describe this phenomenon as a "meander" which is just a fancy way of saying a bend in the river. This bend was created by the Colorado River carving its way through the soft sandstone and veering away from the harder rock. Eventually, over thousands of years, it created this magnificent panorama. The expression, “a picture is worth a thousand words,” is certainly apropos here. This picture, showing both Glen Canyon Dam and the Horseshoe Bend, is from the Wikimedia Commons. The photographer was Christian Mehlfuhrer. 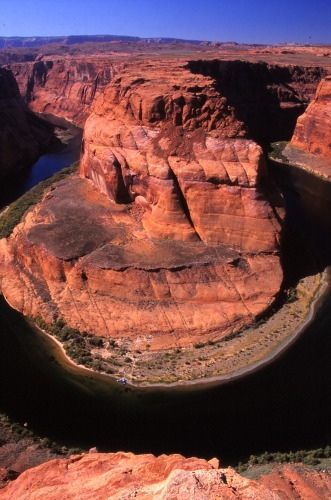 Books and Maps about Horseshoe Bend may be purchased through Amazon.com by clicking the link below. This is a beautiful and intriguing image. It does not, however, authentically capture the view you would see from the Horseshoe Bend overlook. Christian Mehlfuhrer made this photograph by taking several different images, from several different points using a special adaptor mounted to his tripod. He then “stitched” them together on his computer using special software called PTGUi. This in no way detracts from the image. In fact, I think it is a beautiful composite and Christian Mehlfuhrer deserves a lot of credit for his vision in “stitching” it together. I have included the above image to show you how it really appears from the overlook. Magically, Glen Canyon Dam cannot be seen. Again, this is a beautiful image and one you would not typically see. Photographer Shyamal Patel was there at just the right time to make this beautiful image. It's not very often that everything seems to come together at just the right time: the low clouds, the glow of the canyon walls and their perfect reflection in the quiet water. I only wish I could have been shooting right next to him. Although I don’t know all the particulars, I have a feeling that Shyamal didn’t just happen to be there at the just right time. One final shot to show the results of being there at the wrong time. This is an image I took in the middle of the afternoon. While it accurately captures the scene, it is not at all dramatic; especially when compared to Shyamal Patel's. To get to the overlook from Page, Arizona, simply go south on Hwy 89 to the intersection of Hwy 89 and SR 98. Continue south on Hwy 89 approximately 1.5 miles. Turn right on the dirt road at the sign and go west about ¼ of a mile. You will then come to a dirt “parking area,” usually with only a few cars. There you will find a dirt trail leading moderately uphill to the west. Follow that trail approximately ¾ of a mile to the overlook. 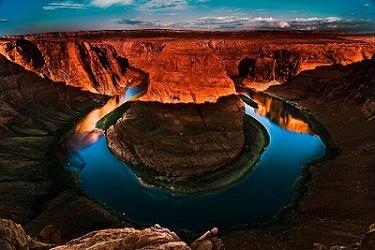 If you are interested in seeing Horseshoe Bend from a completely different view, I suggest you take a float trip on the Colorado River from just below Glen Canyon Dam to Lee’s Ferry. It is a wonderful, relaxing and very scenic trip. If you would like a preview of what it would be like, see my page on Colorado River Rafting. A word of caution: Don’t take the trip just to get another perspective, because the “awe” factor is not the same. But, do take the trip. It is awesome in itself and you will be glad you did. As you can see by Shyamal Patel”s image, Glen Canyon Dam is not visible from this particular location. Christian went to a great deal of work to make this image, and in my estimation it was well worth the effort. Again, kudos to Christian for a spectacular image! Many digital cameras today have a “stitching” capability, which allows you to take several images and “stitch” them together into one panoramic scene. If you are interested in this, read your camera’s manual to see if it has this unique feature. You may not achieve the same quality, but it may be worth exploring it and experimenting with it. If you don’t have “stitching” capability on your camera, use, instead, your widest angle lens. For 35mm film cameras, a 20mm lens will work quite adequately. If you are using a digital camera, I would suggest a 16mm to 18mm lens. Most small compact cameras, commonly referred to as “point and shoot”, do not have that wide a lens. Don’t despair. You can still get some nice images; they will just not contain the same amount of detail you would get from a wider lens. From this overlook, the Colorado River is approximately 1,000 feet below! Please don’t get too close to the edge, and be careful of your footing.